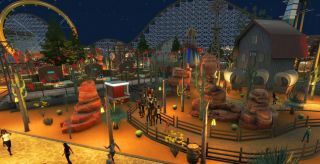 Atari's new Rollercoaster Tycoon World video takes a closer look at how players will be able to create their own in-game content, including objects, scenery, and “peeps,” and then share them with the world through the Steam Workshop. I'm always a bit dubious when I'm told how easy content creation will be, but Atari seems committed to keeping the process as simple as possible. Those with the time, skills, and applicable software can create and import brand-new content, but it's also possible to just snag a model online and use the RCTW plugin to import it into the game. Play Rollercoaster Tycoon World at the PC Gamer Weekender in London from March 5-6. Click here to find out more. Rollercoaster Tycoon World will be on display at the PC Gamer Weekender, running March 5-6—that's this weekend!—in London. Find out more here.